Q1: Where to find Kindle serial number? Q2: How to find purchased Kindle Books? Q3: How to find purchased Adobe DRM-ed Books? Q6: How to find Nook Books? Q7: How to find Kobo Books? Q8: Nook key is invalid? Q9: Why can't we convert some Kobo eBooks? Q10: Why we need to fix some EPUB files? Q11: Need to export books in KFX format, how to do? Q12: Fail to decrypt Kindle KFX books? Q13: I encounter some problems that I can't find in FAQ. How can I get technical support? Where to find Kindle serial number? 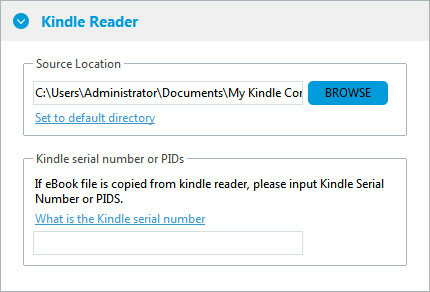 1: View Serial number on Kindle Reader: Home-> Menu-> Device Info-> Serial Number. 2: Remove Space Character from the Serial Number. 3: The Kindle Serial Number is case sensitive. How to find purchased Kindle Books? By default PDFMate eBook Converter Pro Software shall be able to discover your purchased Kindle books automatically and you can see them in the right side library column on the program. If the right side library column is empty, and you indeed synced your purchased Kindle books via Kindle for PC. You can manually add them into the program. 1: Find the correct path of your synced Kindle books. Run Kindle for PC, click "Tools --> Options", then switch to "Content" tab, you will see your Kindle content folder. 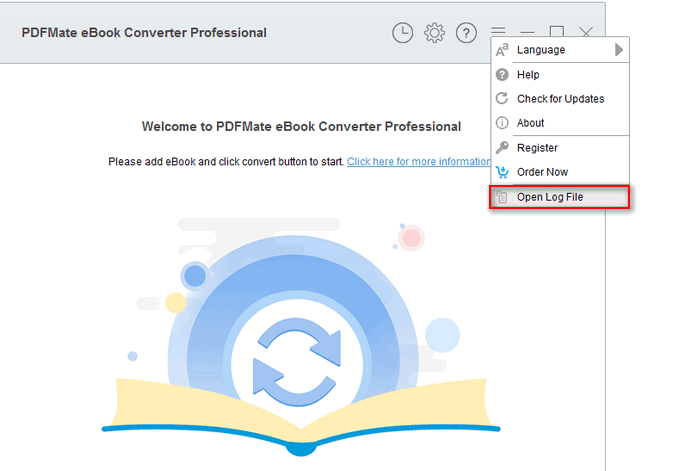 2: Two ways to add eBooks into PDFMate eBook Converter Pro. a. Open the folder, choose the files and manually drag them into the program's interface. b. Click "Quick Settings" button in the upper-right corner, and look at the "Source location" area, you can set the source location to your current Kindle content folder by input the path or click "Browse" to choose the folder. Click "OK" you shall be able to see the books in software's right side library column. How to find purchased Adobe DRM-ed Books? By default PDFMate eBook Converter Pro shall be able to discover your purchased Adobe DRM protected EPUB and PDF books automatically and you can see them in the right side library column on the program. If the right side library column is empty, and you indeed synced your purchased Adobe DRM protected EPUB and PDF books via Adobe Digital Editions. You can manually add them into the program. 1: Find the correct path of your synced Adobe DRM protected EPUB and PDF books. Run Adobe Digital Editions, if you synced books via this program, you will see the books listed in the main interface, right click on the cover and choose "Show File in Explorer", then you you can see where the file is saved. a. 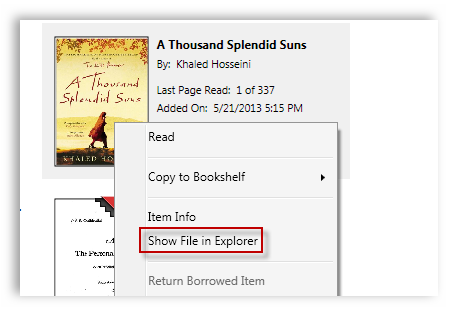 Open the ebook's saving folder, choose the files and manually drag them into the program's interface. b. Click "Quick Settings" button in the upper-right corner, and look at the "Source location" area, you can set the source location to your current epub books content folder by input the path or click "Browse" to choose the folder. Click "OK" you shall be able to see the books in software's right side library column. For removing DRM from your Adobe Adept books, we need some "keys" to decrypt them. And the keys are generated once your purchased Adobe Adept books are synced by Adobe Digital Editions. Therefore, even you can read the Adobe Adept book on other reader apps like Sony, Kobo or Google Play. We still recommend you at least ensure you can read them via Adobe Digital Editions for a successful decryption. Here is the guide. In general, if you authorized ADE with correct account, you will be able to read Adept DRM protected EPUB books smoothly. If the ADE told you "Error: E_LIC_ALREADY_FULFILLED_BY_ANOTHER_USER", that indicates the authorized account is not compatible with the book. If you are sure the Adobe account has no problem, please contact the eBook retailer support to bind the book to your Adobe account. Drag & drop Adept EPUB & PDF books from default ADE content folder to software's main window, and remove DRM. For removing DRM from your Kindle books, we need some "keys" to decrypt them. And the keys are generated once your purchased Kindle books are synced by Kindle for PC. Therefore, even you can read the Kindle book on reader apps on your cellphones or tablets. We still recommend you sync them via Kindle for PC for a successful decryption. Here is the guide. Go to "Archived Items" shelf, double-click each item to download Kindle books to your computer. Make sure you can open and read them. Notice: If you have already done the steps but also cannot remove Kindle DRM, please delete the synced Kindle books at first, then re-sync them again to ensure the keys are generated correctly. And in some cases, users even need to re-install Kindle for PC/Mac to solve the issue. Drag & drop Kindle books from default Kindle content folder to software's main window, and remove DRM. How to find purchased Nook Books? By default PDFMate eBook Converter Pro shall be able to discover your purchased Nook DRM protected ebooks automatically and you can see them in the right side library column on the program. If the right side library column is empty, and you indeed synced your purchased Nook DRM protected ebooks via Nook for PC. You can manually add them into the program. 1: Find the correct path of your synced Nook DRM protected ebooks. Run Nook for PC, open a book to make sure this book is actually synced. Then visit "~/Documents/My Barnes & Noble eBooks/", your Nook books are saved there. 2: Two ways to add books into Epubor Nook DRM Removal. A) Open the ebook's saving folder, choose the files and manually drag them into the program's main interface. B) Click "Settings" button in the upper-right corner, and look at the "Source location" area, you can set the source location to your current epub books content folder by input the path or click "Browse" to choose the folder. Click "OK" you shall be able to see the books in software's right side library column. How to find purchased Kobo Books? By default PDFMate eBook Converter Pro shall be able to discover your purchased Adept DRM protected Kobo books automatically and you can see them in the right side library column on the program. Find the correct path of your synced Kobo books (via Kobo desktop). If the right side library column is empty, please sync your Kobo books via Kobo desktop. By default Kobo desktop store our purchased files as KEPUB format, and they are saved under: "C:\Users\(user name)\AppData\Local\Kobo\Kobo Desktop Edition\kepub". All the Nook books decryption failures are caused by one reason: The entered information is not correct for decrypting Nook books. Below is the guide & tips about how to successfully remove DRM from Nook books. 1: Launch Nook App on your Windows computer. 2: Click on the cover of each title to download Nook books to your computer. 3: Launch PDFMate eBook Converter Pro (free trial). 4: Drag Nook books into the left interface of PDFMate eBook Converter Pro and start removing Nook DRM. Notice: Nook has changed the DRM since 2015, the billing name and credit number method is not working any longer. Why can't we convert some Kobo eBooks? Currently, PDFMate eBook Converter Pro supports converting all Kobo books except for books subscribed via Kobo Plus(rented books). Why we need to fix some EPUB files? EPUB is actually a zip file with the .epub extension. Some eBooks, protected by Adobe/Nook DRM, are not compressed by a standard structure. Hence, these Zip files are technically corrupted and unable to be removed from DRM or will be unreadable even if the DRM is unlocked. 1. Firstly, launch EPUB_Fixer tool. 2. Secondly, use the first "Browse" button to select the EPUB (with DRM) that needed to be fixed. 3. Thirdly, use the second "Browse" button to select where the fixed EPUB (still with DRM!) you want to be placed. 4. Finally, hit the "Fix" Button. Once this process is completed, you can begin use our program to remove DRM from the fixed EPUBs. Need to export books in KFX format, how to do? If you want to export ebooks in KFX format, please install the Kindle Previewer 3 program from here. Fail to decrypt Kindle KFX books, how can I fix it? 1: Click on “Tool” at the top menu bar-->Options-->Registration--> Click On “Deregister”. 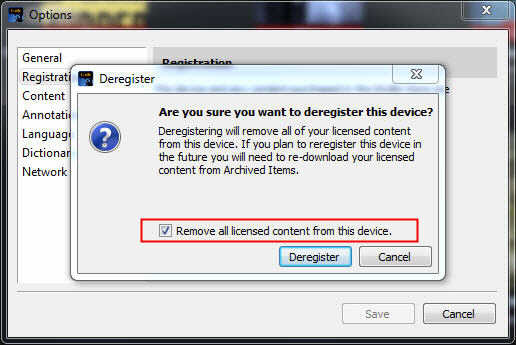 2: A new window will pop up to ask “Are you sure you want to deregister?” Please check the box that says "Remove all licensed content from this device." 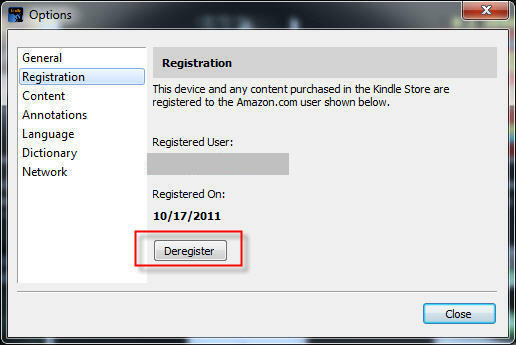 Then click on “Deregister” and you will deregister this Kindle for PC and all your downloaded Kindle books will be removed. 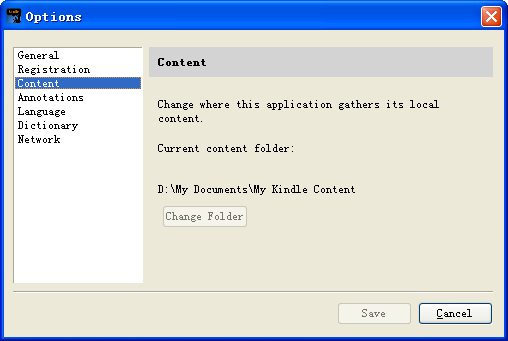 3: Uninstall Kindle for PC and reinstall an earlier version of Kindle for PC, such as V1.24. 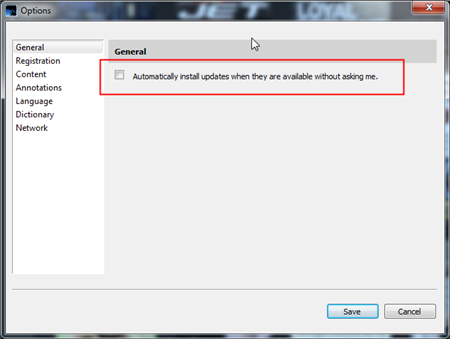 4: Once installed, you need to go into the Apps Tools & turn Off Auto Update. Click "Tools"-->"Options"-->"General"-->uncheck "Automatically install updates when they are available without asking me." 5: Register Kindle for PC and re-download the Kindle Books. Then run PDFMate eBook Converter Professional to remove Kindle DRM. The Kindle KFX DRM will be removed successfully this time. Which kinds of eBooks files did you convert? Kindle file or Adobe file? And the eBook title? Please also send us the log file called log.txt for our analysis. You can find it by going to the program, Menu > Open Log File.